Why not end it the same way? Lady 4 Justice is dedicated to providing professional legal solutions to all of our clients' family related matters. Lady4Justice PLLC is a premier Michigan Family Law Firm with over 32 years of combined experience, practicing in all major counties in the Detroit Metropolitan Area. 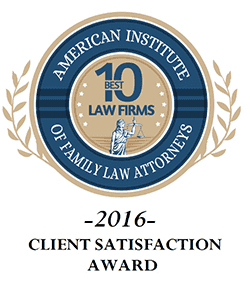 Lady4Justice was recently recognized by the American Institute of Family Law Attorneys as one of 10 the Best Law Firms nationwide for client satisfaction. Please type your questions in the search box at the top right hand corner. How is child support calculated in Michigan? When I began searching for a lawyer, it was with a desire to find someone who was professional, and genuine. I am writing to tell you how much your wisdom and guidance meant to me throughout this process. You have truly found your calling. You make the word "counselor" appropriate for attorneys. In early 2012, I decided to end my 6 year marriage. I had been a stay-at-home wife/mom for 6 years. I was frightened, overwhelmed, and I had no idea what to do. I was in the process of a divorce and my original lawyer's only concern was billing me. He did not defend me, and even agreed that I should pay my lying husband's legal fees.